Enjoy a delicious spiral twist with Le Vian's careful artistry, with rows of Chocolate Diamonds and Vanilla Diamonds that ebb and flow creating a beautiful sense of movement. Wear as a style statement that shows your appreciation for the allure of luxurious pieces. The Le Vian name has been associated with the world's finest jewellery since the 15th century and is now worn by Hollywood celebrities and the glitterati. Total diamond carat weight of 0.8ct. 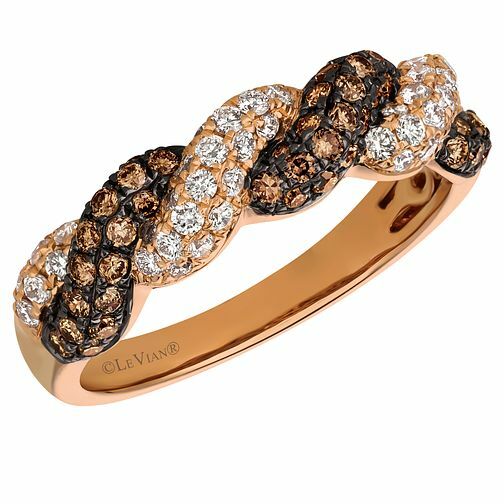 Normally available in sizes I to S.
Le Vian 14ct Strawberry Gold Chocolate Diamond Ring is rated 5.0 out of 5 by 1. Rated 5 out of 5 by Anonymous from Stylish and classy with a hint of edge! A beautifully stunning ring which is much better in real life. This ring is stylish and classy with a hint of edge. The fit is incredibly comfortable and the colours are incredible!